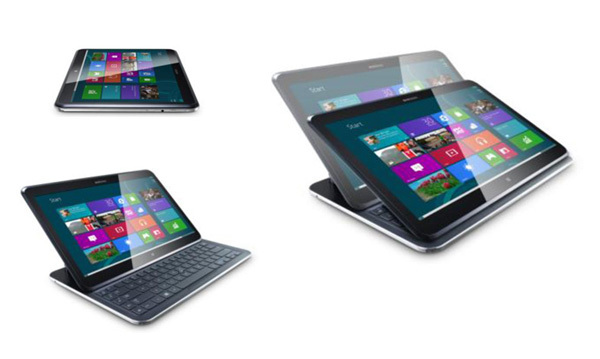 Samsung has announced the ATIV Q, a hybrid tablet running both Windows 8 and Android. Samsung Executive Vice President DJ Lee said that the device is “versatile and adaptable” and can switch between four positions. The ATIV Q features a 13.3-inch qHD+ screen with a 3200×1800 resolution. Samsung says it is one of the “best displays you’ll ever see on a mobile device.” The company also says it will be very easy to use and see in bright sunshine. To switch between Android and Windows 8, you simply need to tap the hardware button under the display. You can also pin Android apps onto the Windows 8 start screen. The device has a unique hinge that allows the screen to sink into the keyboard for tablet use, or rise up and bend several ways for usage with a keyboard. There is no trackpad, however, so you are stuck using a touchscreen for everything, even with a keyboard. The ATIV Q is powered by an Intel Haswell processor which should give you about 9 hours of battery life. Other specifications are unclear, however. It comes in at 13.9mm thin and is just 1.29kg (2.84 pounds) in weight and also features the Samsung S Pen, which Samsung says is optimized for both Windows 8 and Android.